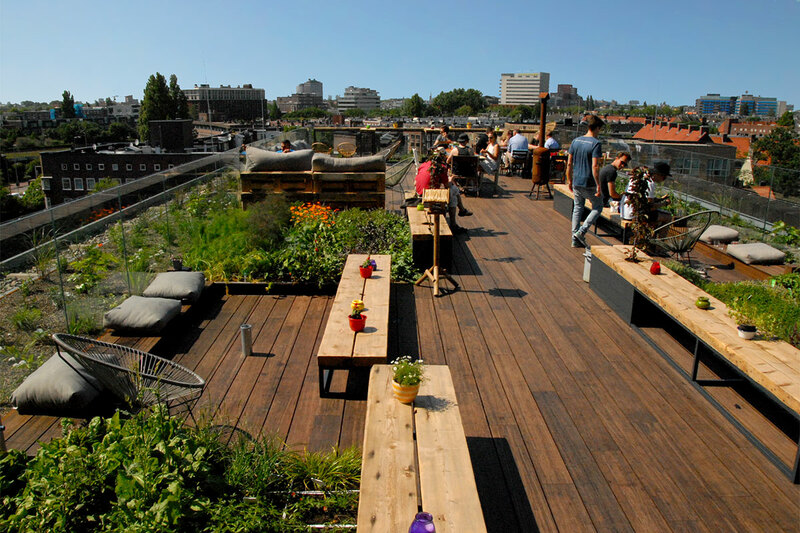 The Netherlands is now experiencing a burgeoning quantity of roof gardens. According to the International Green Roof Association (IGRA), Amsterdam alone has around 200 green roofs, with a total surface area of about 120.000 m2. This article illustrates how green roof projects in Amsterdam are now motivated by more than just environmental benefits. Finding practical and effective ways to implement sustainable development remains a challenge in a world that works on numbers. Environmental green roof benefits along with their financial benefits can have a big impact on commercial buildings. Urban dwellers and cities now appreciate vegetated rooftops for their ability to ameliorate the urban environment. Plants and growing medium layers improve air quality, filter stormwater run-off, prevent flooding, and mitigate the urban heat island effect by insulating and shading the building. 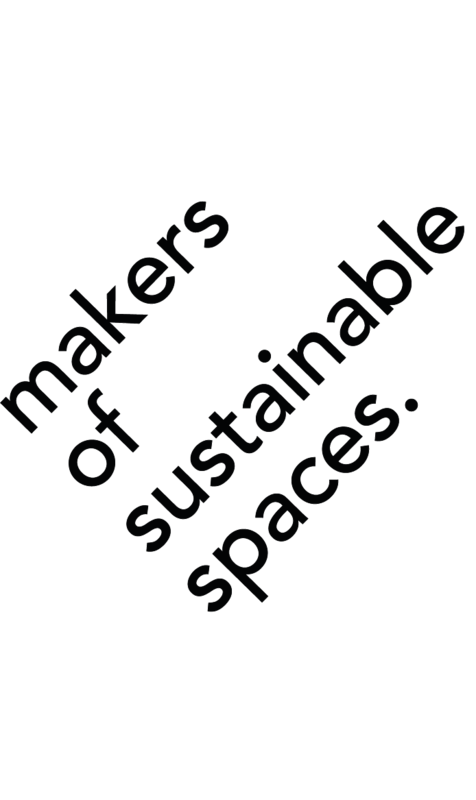 In addition, the added space invites urban dwellers to reconnect with nature, and the growing market lends to job creation for a number of professions. (Diebel, 2016). 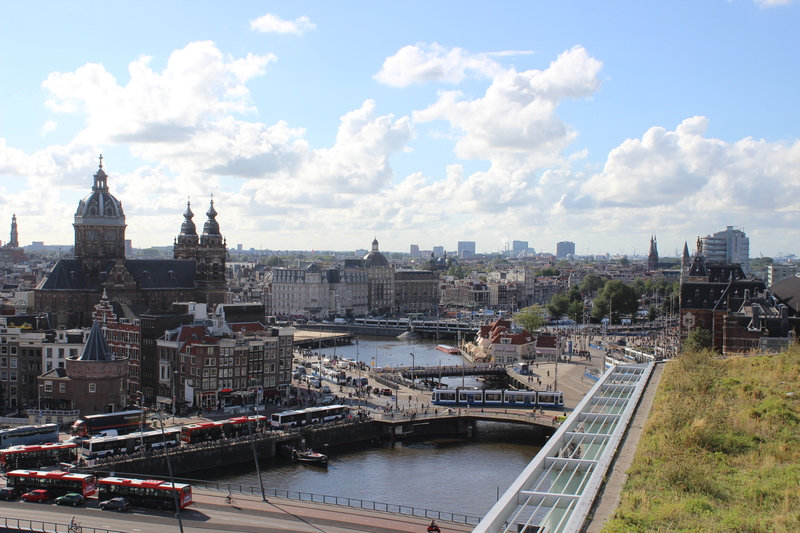 In 2009, Amsterdam launched a green roof incentive program to grant direct subsidies for building owners to install a green roof. The program offers to cover 50% of the installation costs, with a maximum value of up to 50 EUR/m2. In the first two years, 500,000 EUR was applied to promote green roofs and green walls. 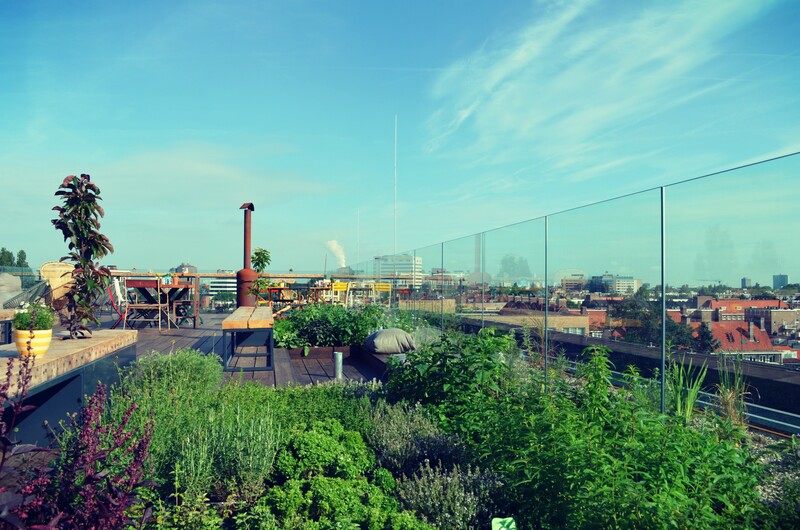 To understand more behind the particular success of Amsterdam’s roof greening trend, 4 roof garden projects are illustrated which have various business model approaches. Green roofs can be judged by the following financial criteria (Porsche & Manfred, 2013): extension of the lifespan of the underlying waterproof system, reduction of the stormwater runoff, improvement of thermal insulation, reduction of sound reflection and transmission, and increase in property value. Moreover, green roofs are able to outlast a grey roof by a factor of at least two. Together with the underlying roof waterproofing, an extensive green roof (5-15 cm deep, lightweight, low capital cost, and minimal maintenance) installation currently costs approximately 75 EUR/m2. The costs are roughly twice those of a conventional roof. While intensive green roofs (15 cm or more in depth, greater weight, higher capital costs, more plantings, and higher maintenance demand) cost approximately 150-300 EUR/m2. Although the investment is higher, there is a greater potential for return from the added property value in accessible roof gardens. The Nest Rooftop Terrace at Casa 400 in Amsterdam is a case with a high investment and high return per m2. In this renovation project, vegetables and herbs grow on the 8th floor of a hotel. The 180m2 roof design realizes a thick green perimeter around lounging bar space. 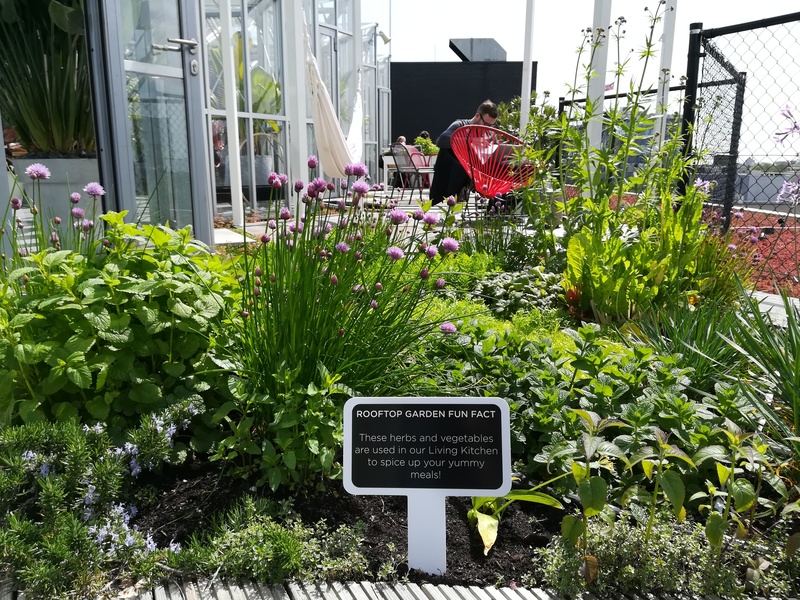 In the outer area, edible plants have been planted as a semi-intensive green roof, while edible plants are internally integrated in the lounging space with HRBS growing trays. In this model, the roof bar and restaurant incorporate herbs and crops from the roof in cocktails and snacks. With excellent marketing, trendy food and beverage concepts, and a chic green space, this project has earned its (300K) ROI within two 7-month seasons. The SkyLounge at the Double Tree Hotel in Amsterdam is a case of relatively low (green infrastructure) investment and high return. Of the two green elements, an inaccessible extensive green roof is visible from indoors, framing a picture of the heart of Amsterdam, and a leafy hedge wraps around the outdoor SkyTerrace. With prime city center location, DJ events, private event space, an upscale menu, and a panoramic view of central Amsterdam, the SkyLounge sees a strong return on investment. This case demonstrates how prime location and stunning views can outplay the attraction of greening. Zoku is a “home-away-from-home” hotel concept for people living and working in Amsterdam. At Zoku, regular activities get a new twist. For example, check- in is on the roof. When guests arrive, they walk through a rooftop greenhouse corridor on their way to reception. Through the glass panels of the green house, visitors can see herbs, fruits, and veggies growing on the roof. There is also plenty of green lounging areas inside and outside. “Green” and “function” have been completely intertwined at Zoku since the first sketches. The building was previously rented by the municipality’s economic affairs office. When the office relocated and this building was left behind, Zoku sought the opportunity to open a long stay hotel with a 83,000 EUR grant for the roof greening. This case is a relatively high green infrastructure investment. ROI at Zoku is seen in hotel room reservations, which are already fully booked year-round. Events will also contribute to ROI, but as the project is still in its first year, it will take longer to distinguish. When the old IBM office building was converted into a co-working space in 2014, the 1750 m2 B.Bylon rooftop was designed to grow 1500 m2 of fruit trees, crops, and herbs. 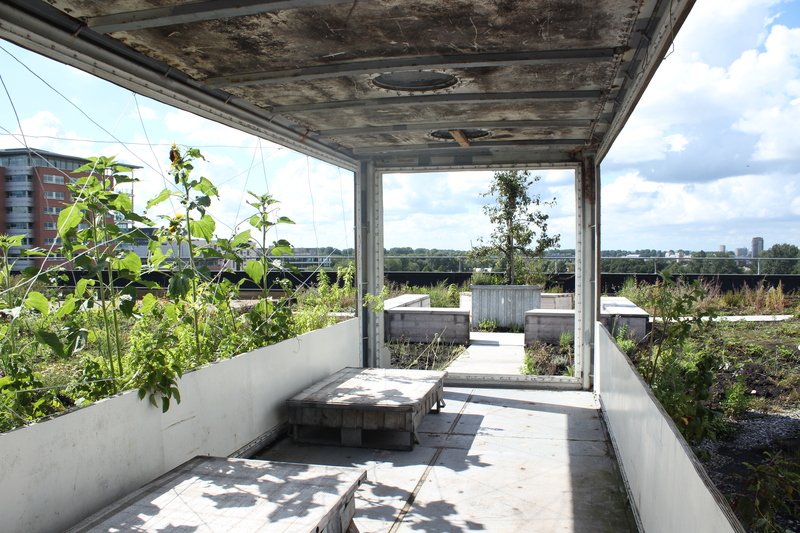 The roof uses both a semi-intensive green roof system, and HRBS trays. The roof restaurant incorporates crops from the roof in its menu, and organic waste from the kitchen is recycled back into the roof’s nutrient system. Since the concept of an accessible leisure roof garden has played a larger role than an economic vision, this is a case of high investment and (s)low return. As the roof is expected to begin hosting small events this year, it will take longer to gain a financial return on the roof. Even though B.Bylon is not located in the city center, it is one of the largest used green roofs in Holland and it’s availability of indoor/outdoor spaces, combined with it’s funky and bright roof landscaping establishes a capacity for high revenue (estimated 300K/year through event planning and hospitality). When given the choice to visit a gray or green venue, most urban dwellers will choose the green space. Well maintained green roofs are charming places to be. The temperate micro-climate, increased biodiversity, and added amenity space is attractive to urbanites. It’s evident how green roofs, which add property value, are more economical than non-green roofs (Porsche & Koehler, 2013). Not only do they add aesthetic value to otherwise dead areas, green roofs have big potential as usable spaces. Then with an emphasis on recycled components, energy conservation, and sustainability, green roofs score points with city planners, the community, and residents. Today, living roofs come in boundless varieties: low growing extensive sedum roofs, intensive roof gardens with trees and shrubs, crop producing roof farms. Some may be relaxing therapeutic gardens, while another may be a wildflower reserve. Limitless varieties open up opportunities for property owners to incorporate a roof garden into their particular business aim. In a city like Amsterdam, where stormwater taxes are not in place to encourage green roof installations, property owners are taking the matter into their own hands for a competitive advantage, added brand value, and company profit.